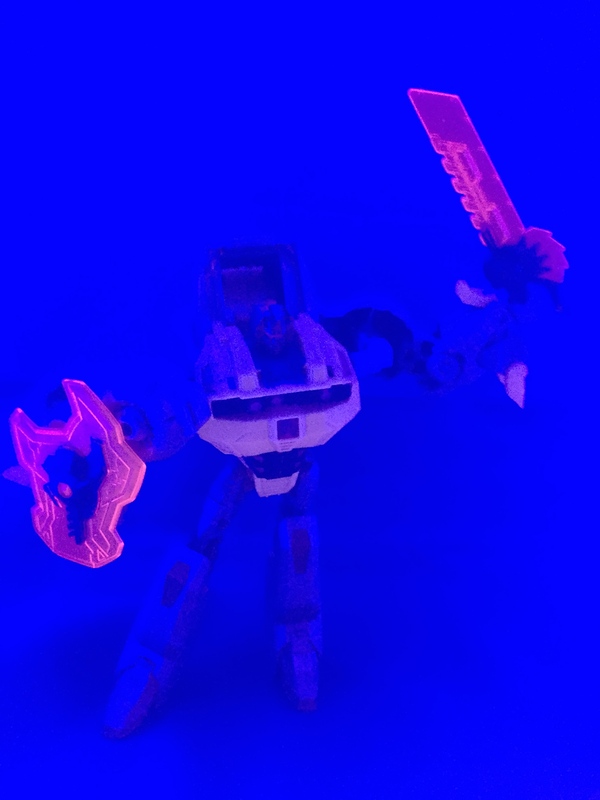 SpartanNerd…Cool Idea- Photograph Toys with a Black Light! Just some fun I had today…something really substantial forthcoming, however, oh Hub City Geeks! 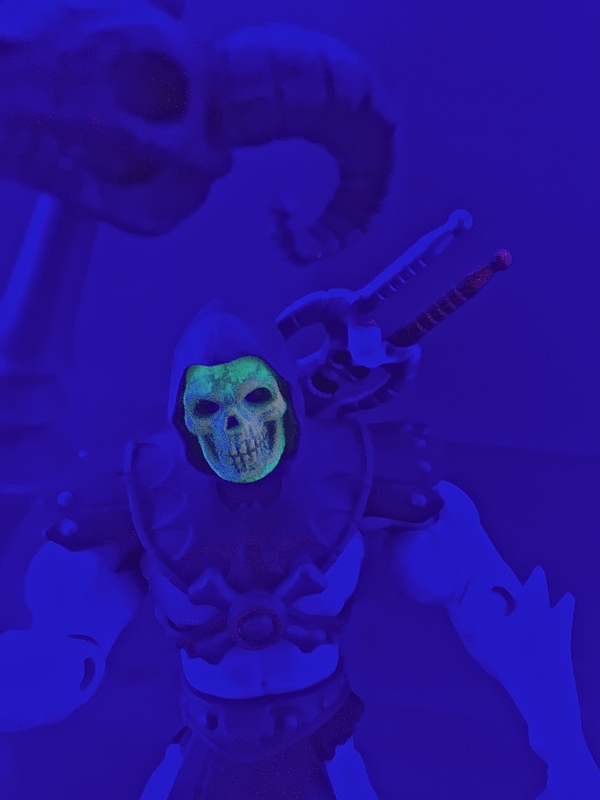 Skeletor is just about my favorite subject to photograph. 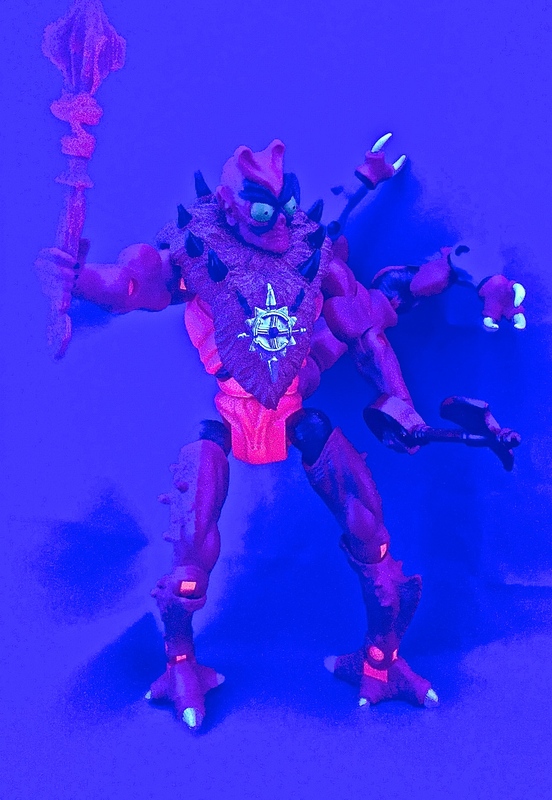 With a black light, his face looks extra gruesome. 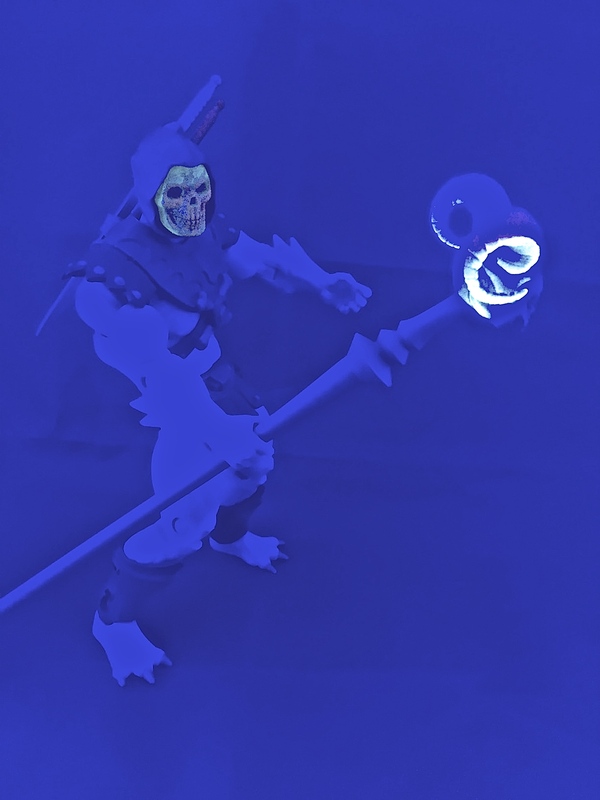 I thought it would be cool to put the Havoc Staff that came with the Faceless One in the black light. It isn’t that apparent in the pic below, but the pink translucent details on the “powered up” part of the staff changed bone white! I’ve never thought that the vintage Mantenna was a very menacing looking figure. (This is my original toy from the 1980’s.) Placing a blacklight on him changes this. The red details become that salmon-isn color, which contrasts to the blue parts of his body that disappear in the blacklight somewhat. His eyeball paint is about gone, but because of this it makes that weird thing that is his mouth seem extra creepy! The cool thing about Grimlock isis weapons. They look translucent amber in person. In the blacklight, though they pp like the science fiction things they should pop like. Last but not least, LILIANA! The cool thing about this pic is as I was editing it with iPhoto, I was playing with the sharpness controls. Lilliana almost disappeared when the control was at 0. As you moved the slider, she would slowly appear or disappear! Just like magic! Because her substantially exposed skin is “flesh-tone”, and her clothes are all purple, this caused the disappearing effect. 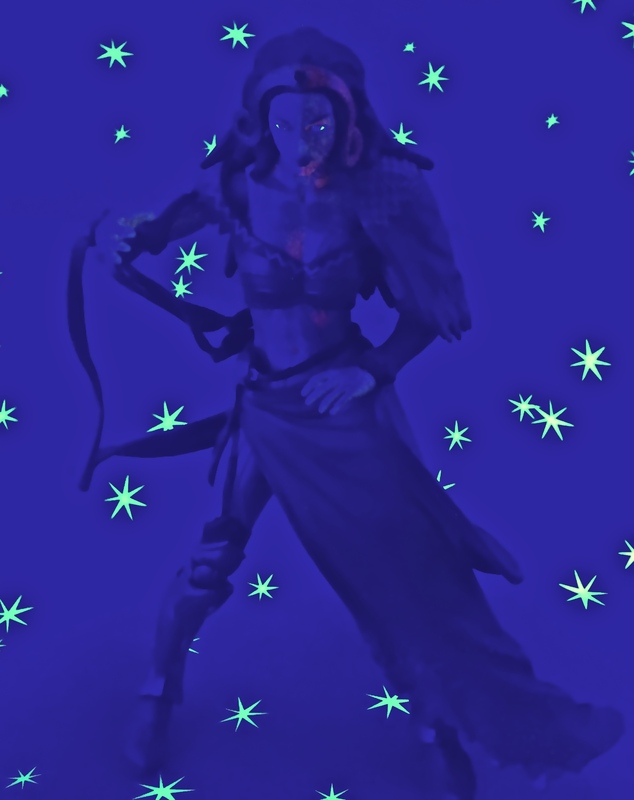 I wish I had a modded Liliana card with this picture on it! This entry was posted in Blacklight Photos, Liliana, Magic the Gathering, Masters of the Universe Classics, Photos, SpartanNerd, SpartanNerd Photos and tagged Blacklight, Draego Man, Faceless ONe, Grimlock, Liliana Vess, Magic the Gathering, Mantenna, Masters of the Universe Classics, Modulock, Skeletor, SpartanNerd, Transformers. Bookmark the permalink.